Today was the Big Storm. As we waited for it to pass and the 80mph winds almost bent our poplars in half and shook the beech tree like a deranged nanny, I thought about lunch. Something healthy, but not salad, something warming, but not soup. I found this in the BBC Good Food magazine, which is about as comforting a magazine title as you can get. It says serves 2-3 and I’d say that’s about right. You can obviously up certain ingredients, such as the squash or the quinoa, if you need to make it go a bit further. I never weigh my squash incidentally. The only thing I found was that this was a bit salty for my taste – ergo delicious – so you may want to not salt the squash, for example. Anyway, this is packed with good things and if only I can resist the bourbon biscuit waiting for me in the kitchen, I will have had a wholly good lunch. 4 tablespoons of chopped parsley (we grow our herbs but struggle with the parsley, so I always have some of this in the freezer. It also stops you paying out 80pence for herbs that then go off in the salad drawer). Preheat the oven to 200C and toast the almonds (whole) for 5-7 minutes, watch them really carefully. When they’re done take them out and at some point before serving, chop them up roughly. Now put the squash in an oven tray and pour over the olive oil, thyme and salt and pepper. Mix it up and place in oven for 30-40 minutes until it’s tender and slightly brown at the edges. When done take out and put to one side. You’re done with the oven now. Put the water or stock in a saucepan and put the rinsed and drained quinoa in, cook for about 12 minutes, until the stock is mostly absorbed and the quinoa is tender to the bite. Now put the cooked quinoa into a large bowl or plate, put the squash on top, crumble the feta on top, scatter the almonds and some parsley and you’re done. You can have this warm (I did and it was superb) or at room temperature. Strikes me it would make an excellent packed lunch, too. For extra veg, eat with a small green salad. I didn’t because I couldn’t be bothered to pick some salad from outside and rinse it, so I’ll, um, have that later. This entry was posted in What's for lunch? and tagged almonds, butternut squash, feta, quinoa on October 28, 2013 by Annalisa Barbieri. I saw this, earlier this year, in Waitrose magazine. I’m not a huge fan of beans, but I cut it out anyway and decided to try it on my eldest when she said she was going veggie. She hated it and the very next day reverted to being a meat eater. That hadn’t been my plan at all. Anyway, this is really lovely. Fresh, filling, tasty and pretty healthy. It makes loads, easily enough for four I think. Fry the onion in 1 tablespoon of the oil for five mins, until just softened and translucent. Add the cumin and cook for another minute then add the black beans and sweetcorn. Warm through and take off the heat. Season to taste and now add the avocado, lime juice, the chopped up coriander leaves, half the wensleydale and half a tablespoon of the oil. Brush the tortillas with the remaining oil and warm up in a large frying pan and pile the bean stuff it to the tortilla. Wrap up and eat and enjoy. ps: you can probably see we customised it with a few home grown tomatoes and some chilli. You can too. Go on I dare you. This entry was posted in What's for lunch? 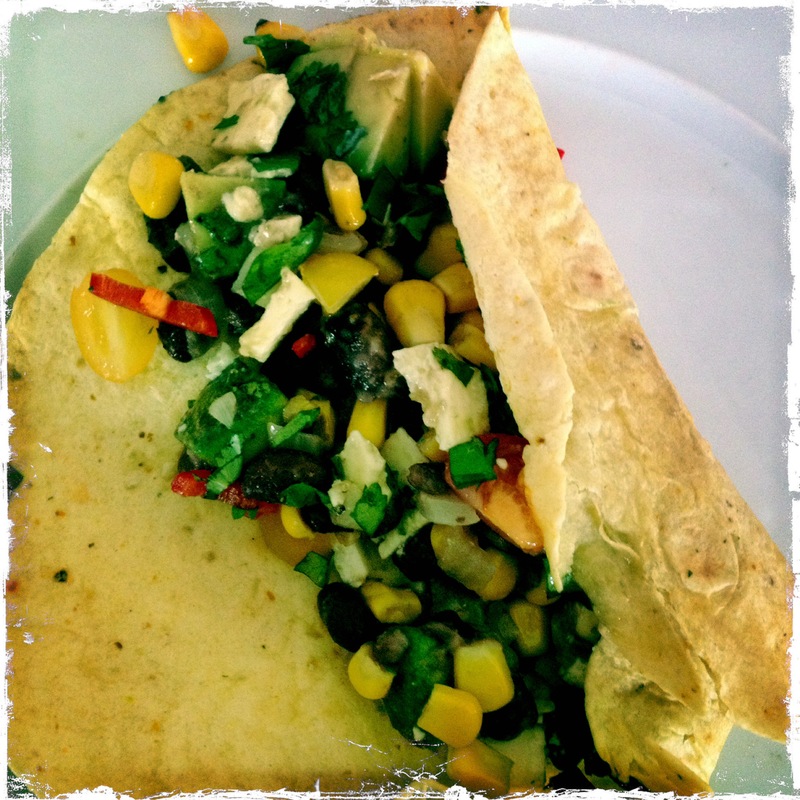 and tagged avocado, black beans, tortillas, wraps on October 2, 2013 by Annalisa Barbieri.